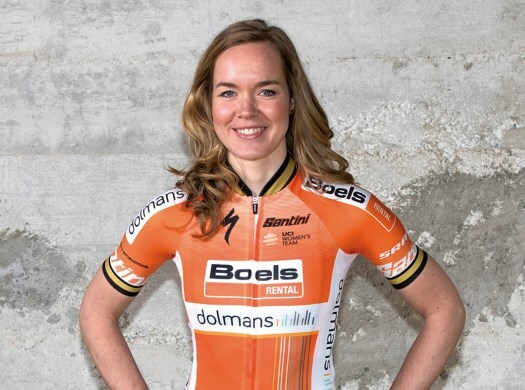 Anna van der Breggen has shown an outstanding performance at the road race of the World Championships and took the victory of the race. The Dutchwoman rode on her own for more than 38 kilometres and crossed the finish line more than four minutes ahead of Amanda Spratt. The women's road race of the World Championships was 156.2 kilometres long between Kufstein and Innsbruck. The race started with the escape of Aurela Nerlo (Poland) and Ana Sanabria Sanchez (Colombia), who built a gap of 50 seconds with the peloton. The Colombian managed to break free from her companion and behind Ellen van Dijk, Cecilie Uttrip Ludwig, Lotta Lepisto and Tatiana Guderzo attacked from the peloton. With 62 kilometres to go, the peloton caught all the escapees and rode together for some kilometres. Moments later, Coryn Rivera (United States) change the rhythm and was joined by Van Dijk (The Netherlands), Elena Pirrone (Italy), Amanda Spratt (Australia), Emilia Fahlin (Sweden) and Malgorzata Jasinska (Poland). With 40 kilometres remaining, Anna van der Breggen (The Netherlands) attacked from the peloton and soon caught the front group. The rider showed to be strong enough to leave the others behind and only Spratt could stay at the wheel. At the end of the penultimate climb and with 38 kilometres to go, van der Breggen left the Australian behind and went away on her own, building a gap of more than three minutes with the chaser. Behind the two, a group formed by riders like Rivera, Guderzo, Karon-Ann Canuel (Canada), Fahlin and Jasinska fought for the bronze medal. An emotional van der Breggen crossed the finish line on her own and completed a successful performance at the World Championships after taking the silver medal at the Individual Time Trial. The Dutchwoman also won the road race at the Olympic Games of Rio de Janeiro 2016. Spratt and Guderzo completed the final podium of the race.